Piedmont equals wines, castles and chocolate, we'll never get tired to repeat it, and wherever you are in our beautiful region, you'll always enjoy our rich and velvety chocolate and our wines will get an extra flavor when sipped in one of our castles. What about Turin, then? Do we have castles and vineyards here too?? Actually yes, we do! In fact, Turin's vineyard at Villa della Regina - the Queen's Villa is the largest European urban vineyard, and we also have a teeny tiny one, right in the historical city center, in Piazza Emanuele Filiberto, as part of a local green project of urban farming. 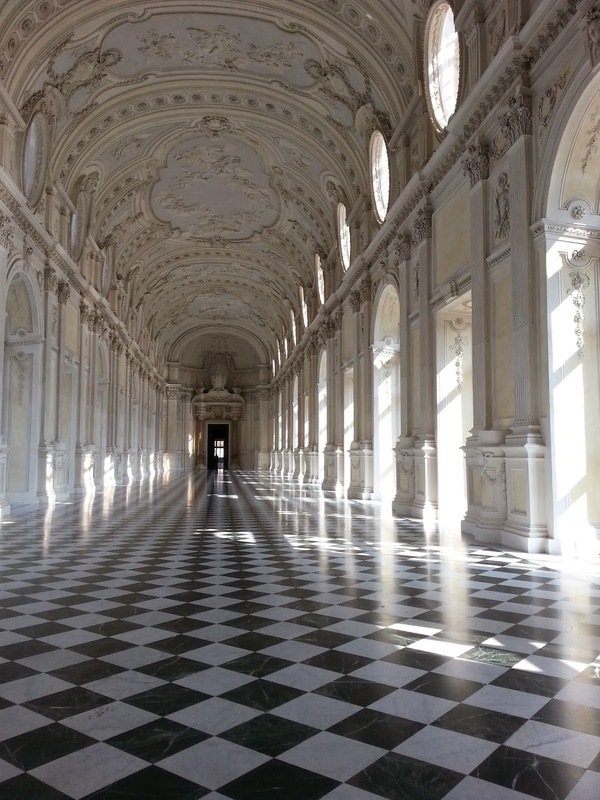 As for castles, we have quite a number, both in Turin and in the suburb; simply put, since the 16th century, our kings enjoyed their lives and the area so much, they had different palaces for different occasions, and definitely, one of the most spectacular is the Royal Palace of Venaria. Back in 1658, King Charles Emmanuel II asked his royal architect, Amedeo di Castellamonte to build a specific residence for when he went hunting and where he could organize sumptuous parties and balls. The architect completed what today we see in the central part of the building, however, by the end of 17th century, under another king, Victor Amadeus II, a new part was added. About a century after the palace was originally started, Filippo Juvarra, an important name of Turin architecture, designed the largest and most amazing parts of this royal residence. Surprisingly enough these dresses are made of paper! During those hundred years of construction, the area surrounding the palace was transformed into a beautiful garden with local and exotic trees, flowers, an herb and a vegetable garden, ponds, orchards, statues, fountains and beautifully arranged paths to better enjoy the green and create the festive atmosphere. This is where the king and his court enjoyed their plays, balls and parties with fireworks. How much fun it must have been! However, the 18th century marked the beginning of its decline as the building wasn't used as much and thus the furniture and art masterpieces it contained got lost. In the 19th century, this royal residence turned into barracks and the garden got destroyed. This was the situation up until 1978 when the Italian ministry of culture bought it and restoration works started to bring it back to its past splendor. This is how it made to the Unesco World Heritage list in 1997 and how it opened to the public in 2007, becoming one of the top most visited Italian destinations. The whole estate is definitely worth a whole day visit: within the royal palace there are always at least 3 different exhibitions and then you can relax, napping on the organic green. There are permanent and temporary exhibitions and many concerts, balls, events and even MTV days are organized in and outside the residence. Special care has been given to bring back to its original spark the gardens, the park and the orchard. The horticulture experts went out of their way to research the original designs of the gardens, bushes, flowers, herbs and even trees. They followed the original natural underground irrigation system and, in the effort of keeping the garden colorful and alive 12 months a year, they selected the specimen we can admire today, arranged according to the original design. The primary goal of the Venaria horticulture team is providing the visitors with a unique experience in the garden, where they can spend a whole day, reading on the grass and enjoying the view. To make this possible, no chemicals are used in the Venaria gardens and the fruits, vegetables and herbs grown are as natural as they were 4 centuries ago. In fact, people can help themselves and snack on the fruit they can directly pick in the orchard. When we went we saw the swam family swimming in of the of the ponds, a gondola and of course the inside of the palace whose major astonishing thing is la galleria di Diana - Diana's gallery, where Diana reminds us of the goddess of the hunt. This is a huge room on the first floor with a black and white checkered marble floor, stucco walls, statues, paintings and large window doors. Just imagine having a party here!